This projector is a Class 2 laser product that complies with the IEC/EN60825-1:2007 international standard for lasers. 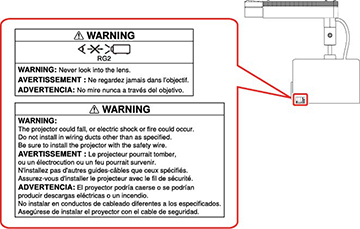 Follow these safety instructions when using the projector. Warning: Possibly hazardous optical radiation is emitted from this product. Do not look at the operating light source. Eye injury may result. If an error occurs with the projector, turn off the power and unplug the projector immediately. Continuing to use the projector could result in an electric shock, fire, or visual impairment. Contact Epson support. Do not open the projector case or attempt to disassemble or modify the projector. The projector contains a high-power laser component. Serious injury could result. Do not look into the lens during projection. Also, do not look into the lens using optical devices, such as a magnifying glass or telescope. This could cause visual impairment. When turning on the projector at a distance using the remote control, make sure no one is looking into the lens. Do not allow small children to operate the projector. 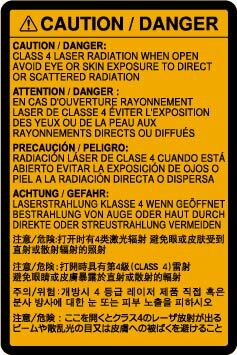 Do not apply optical devices, such as a magnifying glass or reflector, to the projected image. This may result in physical harm, fire, or other damage. Do not block the light from the lens during projection. The high temperature in this area could cause burns, fire, or other damage. The lens may overheat due to the reflected light and could cause the projector to malfunction. Before using the projector, make sure nothing could reflect the projected image. When disposing of the projector, do not disassemble it. Dispose of the projector in accordance with local regulations.